Retirees from all over have already made the move. For years Mexico has been a top destination for tourists coming from North America, and in recent years many people are also choosing to stay and retire in Mexico. There is an estimate of a million American citizens living in Mexico, and these numbers are rapidly increasing. Buying a home in Mexico can be a good investment, you can get a beautiful home, condo or land for a fraction of the price. 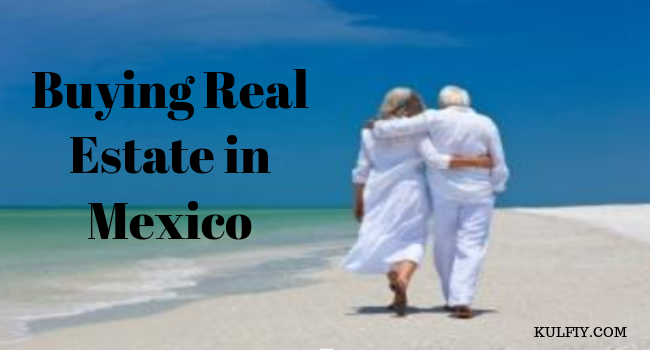 With pensions becoming insufficient to live on and medical expenses on the rise, many people are choosing to retire in Mexico and purchase real estate. If you have the right team! If you start googling on the internet, there are lots of horror stories about people being victimized by dishonest sellers. Most of these stories have to do with buyers trying to cut costs or people become mesmerized by the cheap price and beauty of a property that they don’t do proper research on their investment. A good real estate agent: Preferably one with many years of experience working in the area and have experience dealing with foreigners. A good way to pick the right real estate agents is to check their credentials, look on the internet for an AMPI (Mexican Association of Realtors) member and ask for testimonials from past clients about their experience, other expats or foreigners who have purchased real estate in Mexico. A Lawyer: A professional can save you a lot of money and trouble in the future, by checking all the documents, drafting contracts and protecting your interests in the process of purchasing your Mexico real estate. A Notary: This is a licensed attorney that represents the federal government. A notary has the task of checking the property’s status, the correct payment of property taxes and to record the ownership of the property in the Public Registry if Property. A notary is liable in civil and criminal terms, in case of any trouble regarding the transfer of the title, paying taxes, check the property for liens, debts, etc. When buying a property in Mexico is important to remember this is a different culture, with a different concept of time and urgency. It sounds easy, but for many potential buyers this is the hardest part; dealing with slow times lines and delays, people not showing up for appointments and so on. Talking to other expats, sharing their stories about purchasing real estate in Mexico might ease your anxiety and make you feel more confident. Having a good Mexico real estate agent by your side might ease the process, as they know the procedures and can give you assurance and pressure the right people so things can move along. A wise move or a waste of money? One of the main reasons people get in trouble is trying to buy Ejido Land in Mexico, mainly because of a lack of understanding of what Ejido really is. Ejido land was given to rural communities after the Mexican Revolution, to be worked on by the people living in it. It could be passed among family members or if it was left idle, the community could assign this property to another person or family. Ejido couldn’t be sold, as the real owner of the property was the Mexican Government, until the law changed in the 90’s and allowed families to sell their property. So far it sounds great, the problem is that these properties are not registered in the public registry and you cannot get a legal deed for it but instead a letter from the Ejido stating you as a member of the community and giving you possession rights. In theory, you can get a title for your property and make everything legal, but it is a long expensive process and the lack of clarity about the boundaries and sizes of these plots; may cause problems in the future. When considering buying Ejido land you have to list the pros and cons, and see if this is an investment you are willing to lose. Normally Ejido land is dirt cheap and it can be a huge profit once you finally get your deed, but you also have to consider that the time and money you put into this process can be more expensive and stressful in the long term. Do I really own the property? but a Mexican bank must be designated as the trustee and, as such, has title to the property and is the owner of a record. The beneficiary of the Fideicomiso (buyer), can vacation there, rent the condo to tourists, and remodel the kitchen and so on. If you decide to sell the property this can be done without any hassle to a Mexican citizen or you can sell and pass the Fideicomiso to the new owner if she is a foreigner. Fideicomiso is issued in 50 years periods and can be renewed or transferred to the person of your choosing, either during your lifetime or after your passing. As you can see, even though you do not hold the title to the property or are the owner of the record you have all the rights of ownership. The property is yours, even if the bank disappears, your property and your ownership rights are protected by Mexican Law. Buying real estate in a foreign country can often be an overwhelming task, let Top Mexico Real Estate guide you through the process. We have been helping Americans to learn how to invest and “buy real estate in Mexico” safely for many years. SUMMARY: For years Mexico has been a top destination for tourists but did you know with pensions becoming insufficient to live on and medical expenses on the rise, many Americans are choosing to purchase real estate and retire in Mexico. Before you make this venture there are 5 things that you need to know about buying real estate in Mexico.